Black Canary, one of DC’s top female characters, one of the best fighters in the DC Universe, and frequent love interest for Green Arrow, has kind of a long and complicated history. She’s been adapted to television several times at this point, but there’s some odd things going on for Laurel Lance, the Black Canary adaptation on the CW’s Arrow. So let’s see if we can take a look at Black Canary’s history to see what options Arrow might take in the future stories of this character. Black Canary first appeared as a supporting character in the Johnny Thunder backup stories that appeared at the end of Flash issues. She was immediately very popular, and quickly took over the backup stories, replacing Johnny Thunder. This was August, 1947, during what’s called the Golden Age, making Black Canary one of DC’s first and most important female superheroes. Black Canary was then Dinah Drake, though she eventually married her detective boyfriend, Larry Lance, to become Dinah Lance (née Drake). She became a member of the Justice Society of America, alongside fellow heroes like The Flash (Jay Garrick version) and Wildcat. Then there was a moral panic about the effect superhero comics might be having on the youth (spoiler alert: it turned out to be nothing), and the comics market crashed. DC kept putting out Superman and Batman and Wonder Woman comics, but basically everything else fell out of publication. Then came 1956, and DC decided to try to make a new, if familiar superhero: The Flash. This time it was Barry Allen instead of Jay Garrick, and though this Flash had a different costume and identity, it was still a very similar character. In fact, he even took his name from his favorite comic book superhero, who in his world was Jay Garrick’s Flash. This kicked off what would become known as the Silver Age, and DC reintroduced a number of Golden Age heroes with new costumes and identities (like Hal Jordan’s Green Lantern replacing Alan Scott’s, and Ray Palmer’s Atom replacing Al Pratt’s). Some of their particularly big characters, like Superman, Batman, and Wonder Woman, stuck around more or less unchanged, with just some slight updates recognizing that they had a different continuity than their Golden Age versions. Many of these characters banded together and formed the Justice League, a new, updated version of the Justice Society. And then came the comic that changed it all: The Flash of Two Worlds. Jay Garrick, the Flash, and Barry Allen, the Flash, met each other for the first time. 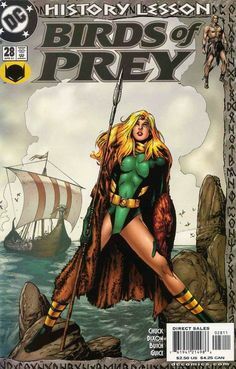 This comic established that despite the total reboot at DC, the Golden Age characters were still around having adventures, just off in a parallel universe. Because Barry Allen was the then current version of the Flash, his world became known as Earth-1, and Jay Garrick’s world became known as Earth-2. The characters occasionally met with each other and eventually it became a yearly tradition for a big comic where the Justice Society teamed up with the Justice League. And that included Black Canary. You might notice that I never mentioned they made a Black Canary of Earth-1. What they did instead was actually a little weirder, before it became a lot weirder. During one of the Justice League/Justice Society team ups, the two teams ended up fighting a villian named Aquarius. Larry took cosmic energy blast for his wife, and died as a result. Heartbroken and needing a change of pace, Dinah Lance picked up and moved from Earth-2 to Earth-1, becoming the only Black Canary of both worlds. Now, this is all well and good, but there were a couple snags. One, they decided that as Earth-1's Canary, she would be a metahuman, having a sonic scream ability, and two, the two universes were more or less running in real time at this point, and the Earth-2 characters were a good 20 years older than the Earth-1 characters. They also decided that she was going to be romancing Earth-1's Green Arrow, and they couldn’t have that big of an age gap, now could they? They decided to kill two birds with one stone with their solution, and the results are frankly just weird. They added a detail that Dinah and Larry had previously had a daughter, roughly about 20 years before. However, that daughter was cursed by a wizard to have an uncontrollable Canary Cry. Not knowing what to do, Dinah and the superheroes consulted with the Thunderbolt, Johnny Thunder’s genie. The genie put Dinah’s daughter into suspended animation in an alternate dimension. Years later, after Dinah had moved to Earth-1, it was discovered that Dinah was dying from cancer caused by her fight with Aquarius. Once more, the genie comes to the (weird) rescue by offering to transfer Dinah’s mind into the now adult but still suspended body of her daughter. And to mess around with her memories, so that she didn’t know anything weird had happened. So now she was a 20 year old superheroine with a Canary Cry on Earth-1 and in love with Green Arrow. Everything is fixed until DC decided to reboot again, this time with the idea that having two universes, with two Supermen and two Flashes and everything was way too weird, and it was time to simplify. Marv Wolfman and George Perez were put in charge of writing the event story to explain the reboot, Crisis on Infinite Earths, and then to be the architects of the post reboot DC Universe. These guys were big fans of DC, and so their method was to go more or less as minimally invasive in the reboot as they could, the major changes being merging the multiple universes into a single timeline, and pushing up the dates that some of these characters first appeared. Their goal was more or less to keep as many previously published stories in continuity as possible, so the Earth-2 Golden Age heroes were established to have been the first wave of superheroes who rose up throughout the 40's, and then the more current superheroes to be a new generation that followed in their footsteps. And here Black Canary once more had a problem, because she was active in all the Golden Age stories that they were trying to establish as still canon, and she was active throughout the Silver Age and the new Age as well, but with superpowers now. To explain this, they went back to the earlier story about Dinah’s camatose daughter. They dropped the part of her being put in suspended animation, and she just grew up like a normal girl with a superhero mom and a metahuman voice. Larry still died in the fight with Aquarius (or somewhere along the lines), and Dinah still got cancer, but without an empty body to put her mind into, she just accepted it was the end of her life and died. And now her daughter, known as Dinah Laurel Lance, became the new Black Canary, who was in love with Green Arrow. Yeah, Black Canary and Green Arrow’s romance was kept around, and they wanted to keep in continuity a lot of the stories the two had had together already, and to keep those stories around, they had to establish Black Canary II’s identity as also Dinah Lance, and also have more or less the same personality (with some differences and quirks to be established later). This has led to some odd sticking points, namely that depending on the canon you’re looking at, pre- or post- Crisis on Infinite Earths, all the stories of the Silver Age Black Canary, where she’s first romancing Green Arrow, can be either Dinah Drake or Dinah Laurel Lance. Yeah, that’s a little bit weird. Bottom line, Dinah Lance, the Black Canary of Earth-2 is actually the exact same person as Dinah Lance, the Black Canary of Earth-1. So where does Black Siren come from? Bruce Timm’s Justice League animated series was essentially an adaption of the DC Universe, but with a continuity all of its own. It was running as a continuation of Batman the Animated Series and Superman the Animated Series, and had a world where Superman and Batman showed up first in the 90's, and helped form the Justice League in 2000. In the season one episode “Legends”, the Justice League is accidentally transported to an alternate universe, where they meet a team of superheroes that Green Lantern recognizes as his favorite comic book characters from when he was a kid: The Justice Society of America. Or actually not. It was supposed to be the Justice Society of America, with Jay Garrick Flash, Alan Scott Green Lantern, Wildcat, and, of course, Black Canary, but DC editor Len Wein didn’t like the versions of the characters as they appeared in the episode. The episode made oblique reference to the racism and sexism of the time period, including amongst the supeheroes (which, you know, is pretty accurate considering Wonder Woman, who fought on the frontlines of WWII and was a wartime nurse at the same time, was made the secretary of the Justice Society). The characters in the episode also turn out to be illusions created by a nostalgia ridden evil psychic, so there’s also that. In any case, Len Wein would not let the show use the Justice Society characters, but okayed the appearance of slightly redesigned and renamed versions of them. Green Lantern became Green Guardsman, Wildcat became Cat Man, the Flash became the Streak, and Black Canary became... Black Siren. So Where Does This Leave Black Canary on Arrow? This is where we’ve got a couple things to note. First off, I’m going to reserve the possibility that Laurel is “dead”, not dead. She had supposedly stabilized in the hospital, and asked Oliver to do her a favor moments before her death, so there’s a chance there’s some trickery going on here. But showrunner Marc Guggenheim is swearing up and down that there will be no fakeout this time and Laurel is officially kaput. So let’s take him at his word for now; Laurel is gone. Or at least this Laurel is. With the introduction of Earth-2's Black Siren imminent, there’s a chance that this is an attempt to reboot the character, more or less. There’s a lot of issues that fans have had with Laurel as an adaptation of Black Canary; her personality, her career, her lack of innate Canary Cry, her going by Laurel instead of Dinah, the weird, messed up history between her and Oliver that pretty much sunk any chance at their (comics canon) romance. Killing off the Laurel we know, and having her Earth-2 equivalent join the team in her place would be a way of getting a fresh start at a better adaptation of Canary, while keeping the same actress and general identity. Supporting this theory is the fact that Earth-1 Laurel’s last words were letting Oliver know that he was still the love of her life, a statement that would seem a little odd or even cruel on its own, but may indicate that Earth-2's Laurel would carry similar sentiments. Also worth noting, Earth-2's Laurel lost her Oliver (as their Green Arrow is actually the surviving Robert Queen), and a heartbroken Laurel finding out there’s another Oliver who lost his Laurel and moving across universes in the name of love actually has precedence. All that said, there’s some flaws to this theory. Arrow has more or less maintained an air of being the ‘grounded’ and ‘realistic’ show (though there’s some magical villains and resurrection devices that might beg to differ), and it might be deemed too outlandish for Arrow to feature a main character who moved here from another universe. Beyond that, this kind of storyline would require quite a bit of forethought and planning, and well, this season’s death came about because at the beginning of the year they decided to film an unmarked grave and figure out who was in it later. Planning may not be their forte at the moment. Lastly, one might also consider that maybe this show is just erasing the character of Laurel entirely, without much of a plan to replace her in any direct way. Where does this leave Black Canary, then? I mentioned that many details about Laurel never sat quite right in terms of being an adaptation of Black Canary. Her personality, her level of fighting prowess, her relationships, and her battle with addiction never really felt like Black Canary, and in fact shared much more in common with Kate Spencer Manhunter (making this the second time Arrow’s killed her). But someone else has much more faithfully adapted major chunks of Black Canary on this show: Sara Lance. Sara’s a badass martial artist and globetrotter, like Black Canary; Sara’s a free spirited, not particularly ambitious lady, like Black Canary; Sara’s had a romance within the League of Assassins, resulting in her needing to use the Lazarus Pit, like Black Canary. Sara took care of Sin, Sara’s teamed up with and fought Slade on a desert island, Sara’s time travelled, Sara’s on a rag tag team of adorably dorky, unprofessional superheroes. Even her current costume looks like Gail Simone era Black Canary’s costume (albeit in white), more than Laurel’s ever did. It’s sad to see Laurel go, but if you’re afraid the CW has killed off one of DC’s most important female characters, you might have been looking at the wrong Canary. Laurel may or may not be gone, but the spirit of Black Canary lives on.